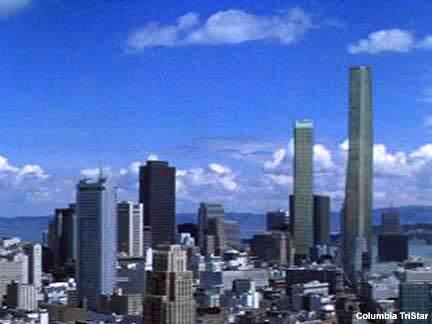 Image Capture: Norcal Movies The San Francisco skyline is (dis)graced by two impossibly mammoth towers in The Towering Inferno. The taller one goes up in flames on its opening day. The pre-digital 1974 disaster movie is directed by Irwin Allen and John Guillerman. Steve McQueen, Paul Newman, and William Holden lead one of those all star casts required for a big 1970s disaster flick. This one includes Faye Dunaway, Fred Astaire, Susan Blakely, Richard Chamberlain, O.J. Simpson, Robert Vaughn, and Robert Wagner. The Bank of America Building stood in for the doomed tower in ground level shots. Lobby shots are the Hyatt Regency. Watch as Fred Astaire enters the BofA building then ascends the Hyatt's escalator in the same scene. The Blakely character's Pacific Heights mansion is 2898 Vallejo Street.